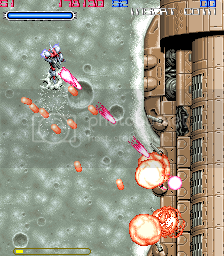 ok so the scoring seems pretty straightforward, but i just discovered this amazing shmup and wanted to see if anyone else was playing it? any interest in a HS thread? 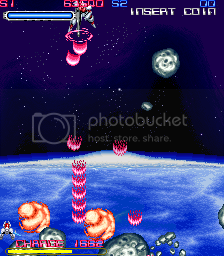 This is a great shmup, although I am having insane troubles in stage 4. I like the variety between the levels. Middle of stage 1; I stay at the side to take out this green battleship. After each level, the game changes your weapon armament. You always stick with the beam sword, though. 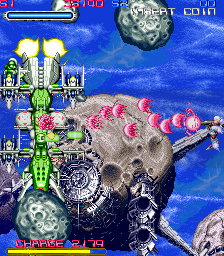 A large battleship in stage 2. Notice the bullets. Try this game out in MAME, people. Ed: He asked for mustard Eddy! Do you have corn in your ears mister? aww man finally someone else has discovered it and my monitor just went bust.. f**k!! i'll have to fix somekind of supergun setup..
for some reason this game feels kinda cave'ish too me.. am i crazy or..?? If you hold down either attack, you'll lock into the direction you are currently facing. 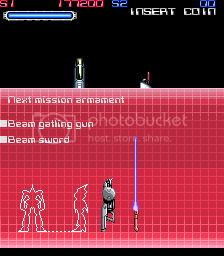 This can be very beneficial if you're using autofire with your rifle; rifle autofire won't lock your direction as the game considers you to be pressing the attack button constantly, so you'll need to hold down the beam saber button to lock your direction. The stage 1 boss spawns enemies that you can milk for a decent amount of points. After a fixed period of time, it will spawn 4 mechs, and it has an attack pattern where it flies off the screen and shoots 4 bits that you have to destroy to get it to come back. Try to balance it so that after you kill the 4 mechs, you trigger the 4 bits attack while the mechs take their time to spawn. Triggering the 4 bits pattern is kind of tricky; it seems like it usually triggers when you get close to the top of the screen but it doesn't seem to work 100% of the time. Armor: You'll get (1000 * amount of health remaining) points, up to a maximum of 8000 for full health. Time: Basically, going for a speed kill on the bosses will get you the most points. I think each stage has a different starting value (or it starts at some value and is just naturally reduced by the natural length of the stage), and I think it's reduced by 100 per second. The most I've obtained is 20K on stage 4. Shoot: You'll get points for every enemy you kill, I think 100 per enemy, up to a maximum bonus of 20K. Missiles count toward this bonus. Depending on whether your health is full or not, the stage 1, 2, and 3 bonuses will give you either 99990 or 50000 points at the end of the stage. The stage 4 bonus is actually a nifty item that grants you 100K regardless of your health, and it is picked up in the middle of the stage. 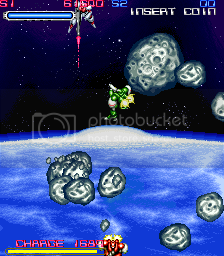 Stage 1 - collect the energy power-up near the beginning of the level. When you defeat the boss, kill the green mechs that are gathered around the red one before they flee. Stage 3 - keep the cannon alive all the way to the end of the stage. It can take a number of hits before it's destroyed but it'll only take damage while you have it attached. You can let go of it and grab it later if you want, just make sure it doesn't fall off the screen. And make sure you're holding it before the score screen comes up. Stage 4 - a little after you exit the tunnel, you'll come to an area where you can destroy pipes. On the second pipe, there is a structure on the left with its middle vent closed. If you shoot it with your rifle long enough, an item will come out (2P side will need to destroy the structure connected to the third pipe). The positioning is kind of strange; you need to move into it a little. Be careful that you don't reveal the bonus item too early as it can disappear off screen. Stage 5 - this one you'll probably get without knowing, but it just seems weird to me that it's worth mentioning. Once you kill the red mech that appears after the 4th battleship, it'll attempt to grab you in a last ditch effort to self-destruct and kill you. Let it grab you and you'll get a nice 100K, but if you actually avoid it, you only get 5K, wtf? However, if you don't kill it in time, it'll time out and go for a grab. If you get grabbed before you can kill it, it's instant death and game over (it even goes through the shield). Avoiding the instant death variant also grants a paltry 5k. That bonus item on stage 4 is actually a defensive mechanism that you get to use on stages 5 and 6. It comes with a limited number of charges, based on how many Special Bonuses you've received from stages 1 to 3. You don't need to get the full 99990 points, just getting the Special Bonus is enough to give you more charges. The maximum amount of charges you can get appears to be 30. To use the shield, press the saber button and before the animation completes, perform a quarter circle clockwise motion (2P side does a counter-clockwise motion). You don't have to start in any specific direction, the motion just has to come out during the saber animation. The timing isn't too strict, and you might be doing this often by accident, especially with autofire. This shield protects you from all sources of damage. It also slows you down for about half the duration of the shield, so you should already be close to your target if you intend to use it offensively. Each use lasts for a good long duration, and is especially useful against the final boss. You'll also get 10K points every time you use the shield, for a total of 300K points if you get the maximum 30 charges. One more bonus/scoring trick left?